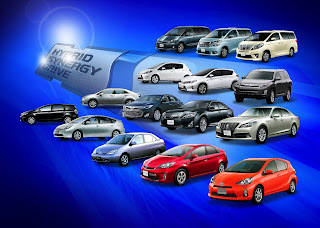 Toyota Motor Corporation (TMC) says cumulative global sales of its hybrid vehicles have topped five million units. The company said it took just 11 months to sell the latest million, bringing the total to 5,125,600 at the end of March - including more than 50,000 in Australia. Prius is the world's best-selling hybrid vehicle with more than 2.9 million sales. In Australia, the locally built Camry Hybrid has recently overtaken Prius to become the top seller. After releasing its first hybrid vehicles in Japan in 1997, Toyota took almost 10 years to reach one million sales. Since then, consumers have been buying hybrids at an ever-faster rate. The second million was posted in two years and three months, the third million took 18 months and the fourth million 14 months. Last year, hybrid vehicles accounted for 14 per cent of TMC's global vehicle sales and 40 per cent of its sales in Japan. The company sells hybrid vehicles in approximately 80 countries and regions around the world and is committed to expanding its hybrid line-up and sales destinations. TMC vice chairman Takeshi Uchiyamada, who was responsible for development of the first-generation Prius, welcomed the widespread adoption of hybrid vehicles by consumers. "We developed the first-generation Prius with the aim of making it a car for the 21st century and as an indication of Toyota's response to environmental issues," Mr Uchiyamada said. "We had to develop a hybrid system from scratch, making our task extremely difficult; nevertheless, we took on the challenge. "The launch of the first-generation Prius had effects beyond our expectations, with the vehicle increasing consumer environmental awareness and raising hybrid vehicle expectations." He said Toyota has positioned hybrid and the components needed to develop ultra-low or zero-emission cars as core environmental technologies. Toyota plans to continue working to further raise performance, reduce costs and expand its line-up of hybrid and non-hybrid vehicles that reduce the impact on the environment.